Floods are among the most destructive natural hazards. Learning about the best practices to prevent, clean and restore flood damage in your home is essential in order to minimize accidents, health problems, and the need for costly repairs. Flooding can be a nightmare for every homeowner. Not only is it difficult to deal with, but repairing flood damage is also a very expensive undertaking. The garage is among the parts of a home that are most prone to flood damage. Thankfully, there are plenty of ways to deal with it. But before we jump into that, let us first talk about the most common causes of garage flooding. Sewer flooding can happen for a number of reasons. For instance, there could be a failure of the sewerage, too much pressure, or blockage in the drainage pipes. 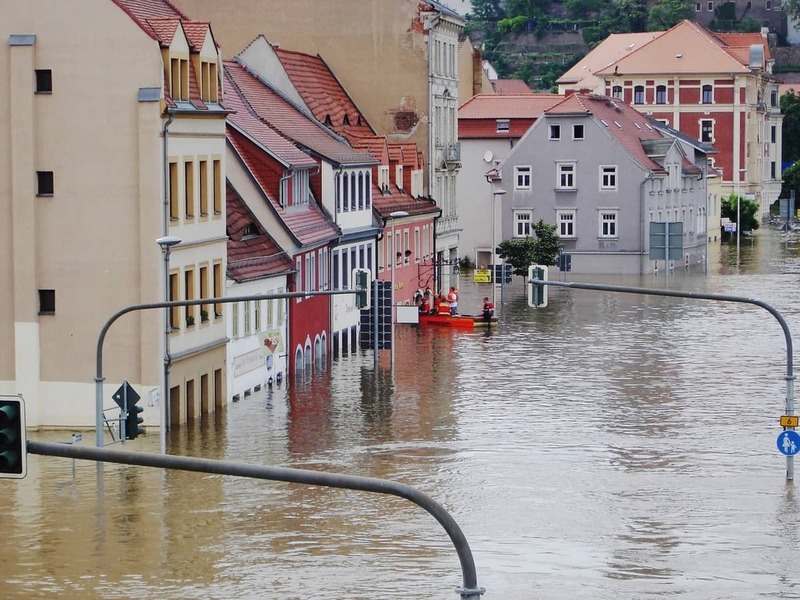 These problems are often triggered by bad weather conditions, such as when too much rainwater enters the sewers from surrounding houses, roads and land. Sewage leaks can happen from underneath the garage and seep up, causing water damage inside the garage. Fresh water pipes (which are located in the yard) that supply water to a house can burst, which causes the water to enter the garage from the ground below. Heavy rainfall, hurricane or storm surges can almost cause flooding especially in lowland. Overflowing water from nearby sources, including streams, broken dams, or lakes can cause flooding too. Addressing water damage problems in your garage before, during and after flooding is essential. Prevention is better than “repair”. Taking time to determine sources of water that could serve as potential trigger for flooding is important. Check your drainage pipes and if necessary, divert water from the garage. Burst pipes should be fixed immediately as well. If you live in a lowland area, consider installing garage barrier in your property. A flood barrier is a good investment especially if your garage contains household items that are hard to replace or too expensive to just be damaged by water. Weather-stripping the bottom of your garage door is very important to prevent water damage. If you already have weather-stripping in your garage door, conduct a routinely to ensure that it hasn’t worn out yet. Maintaining a strong foundation is crucial to preventing flooding in your garage. Have it inspected regularly for cracks or damage which could cause sewage line or sewer water pipes to burst. Your gutters have a very important role in protecting your garage from water damage as they designed to lead water (from rain or melted ice) through a downpipe and out to the drainage system and away from your home. Make sure to clean your gutters from leaves and other debris and repair any crack or holes. Do the same thing with the rest of your garage roofing system. Applying waterproof veneer to the walls will create a seal to ensure that water doesn’t seep in. Flood drains divert water path away from your home and garage. They are a very helpful addition especially whenever there is a serious flooding in your area. Additionally, smooth down uneven ground that could direct water to your garage. Before entering your garage, check if there are no major damage that could compromise your safety. Keep children and pets away from the flooded area until the cleanup is complete. They have to be washed and dried completely under the sun. Items that have been badly damaged or soaked in water and can no longer be disinfected must be discarded. Drywall and insulation that have been soaked in water are likely to be removed and discarded as well. Make sure that you are also properly geared to avoid exposure to contaminated floodwater. Once the water has been removed, wash the floors, walls and other surfaces with soapy warm, clean water. If there’s mold, scrub to remove it. If the mold infestation is too large to handle, it is better to call professionals for help. An air mover significantly speed up the drying time by reducing the amount of moisture present in the air. Have your garage interiors dried completely before re-organizing or putting items back. Call water restoration professionals to ensure that there was no serious structural damage in your garage. Ask about the different options or ways to better waterproof and flood-proof your garage in the future. The garage is an important extension of any home. It’s where you store some of your most valuable belongings. Find your nearest Bin There Dump That location to assist in the restoration process. These tips and key practices should guide every homeowner in preventing, cleaning and restoring flood damage.